A National Guardsman named Spc. Ryan G. Anderson stands accused of trying to aid Al-Qaida; the case looks strong, as the government has a 58-minute videotape of him telling undercover military personnel such things as: "I wish to desert from the U.S. Army. I wish to defect from the United States. I wish to join al-Qaida, train its members and conduct terrorist attacks." A city judge and mother of three from Conrad[, Montana] used the Internet to help authorities nab a National Guardsman accused of trying to aid Al-Qaida. Judge Shannen Rossmiller, 33, is a key witness in the case against Spc. Ryan G. Anderson, a Fort Lewis-based National Guardsman and Muslim convert. Anderson, 26, faces five counts of trying to provide the terrorist network with information about U.S. troop strength and tactics as well as methods for killing American soldiers. Rossmiller told the court Wednesday that she is a member of 7-Seas Global Intelligence, an organization that tracks terrorist activity and forwards leads to authorities. She often surfs the Web late into the night at her home in Conrad, a town of 2,750 an hour north of Great Falls, searching for clues of terrorist activity. Last year Rossmiller's work led her to a posting from Anderson, who was using the name "Amir Abdul Rashid." Rossmiller baited "Rashid" by posting a call to jihad against the United States and he replied. "He was curious if a brother fighting on the wrong side could join or defect," Rossmiller told the court. After a series of e-mails with him, she contacted the Homeland Security Department, which put her in touch with the FBI. Although Rossmiller "doesn't really fit the bill of a terrorist spy," she's deeply dedicated, her husband said. Much of her free time is spent on-line. "She's one of those people that doesn't have a regular sleep schedule so she's up sometimes in the middle of the night doing this," he said. He said his wife has helped identify at least two other persons of interest. "She lives and breathes this stuff, especially when she gets on the trail of someone like Anderson," he said. Rossmiller had been corresponding with Anderson since October. He was arrested in February after he allegedly tried to pass information to undercover Army investigators. The Seattle Post-Intelligencer cites cites Rossmiller's explanation that 7-Seas Global Intelligence is a group of seven amateur counterintelligence Web-surfing hobbyists tracking terrorist activity and providing information to the government. Its members include four in the United States, one in Australia, one in Indonesia and another in Canada. on one of Rossmiller's trawls through Web sites with names like bravemuslim.com last fall, she came across a posting by a man calling himself Amir Abdul Rashid. It was clear from the message that Rashid was edging toward the violent fringes of Islam. Over time, it also became apparent to her that he was an American soldier. Posing as an Algerian with ties to that country's outlawed Armed Islamic Group, she sent Rashid an e-mail with the subject line "A Call to Jihad." Rashid responded by asking if it was possible that a "brother fighting on the wrong side could defect." Over a period of four months, Rossmiller drew out Rashid through a series of 27 e-mails. She learned, with growing alarm, that he was a National Guardsman about to be deployed to Iraq. And he appeared willing to share information on American troop vulnerabilities with the enemy. Rossmiller provided the information to the Department of Homeland Security, which passed it to the FBI and the Army. she has invented and developed several characters whose identities she assumes when visiting Jihadi chat rooms and bulletin boards. Nobody in 7Seas speaks Arabic, and Rossmiller might spend weeks translating a posting using software and a dictionary. The details of the personalities she assumes are just as painstakingly assembled. Their street addresses are real. She knows the address of the nearest mosque and the name of its imam. A message pops up on her computer to remind her when it would be prayer time, so she remembers to stop what she's doing. She has software that "proxies" her computer address to that area, making it appear to all but the most savvy Internet user that she's physically there. It helps that her husband, Randy, is a computer technician. Rossmiller spends hours researching the philosophical underpinnings of terrorist groups. If she were a Kashmir radical, she points out, her motivations would differ from those of a Saudi Arabian or Afghan. Her postings can be brazen. Rossmiller says the goal is to flush out terrorists, and being timid or obtuse doesn't get it done. "I've found that the only way to get information is to be a little bolder than they are," she said. "This is not conventional. There is no textbook for this." In addition, this account tells more about 7-Seas Global Intelligence and cites other examples of citizen activism. Sep. 2, 2004 update: Anderson was convicted of trying to aid Al-Qaeda. Sep. 3, 2004 update: Anderson was sentenced to life in prison. 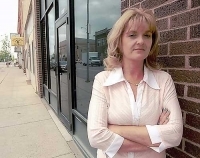 Feb. 11, 2006 update: Would-be terrorists, beware; Shannen Rossmiller is back on your trail! His last known address was Room 205 at the Thunderbird Hotel in Pocatello, Idaho. In the FBI sting two months ago, Reynolds was drawn to a meeting with a purported al-Qaeda operative about 25 miles from the hotel, where he expected to receive $40,000 to finance the alleged plot. The al-Qaeda contact was actually Shannen Rossmiller, a 36-year-old judge who lives in Conrad, Mont. She was working for the FBI. "Yes, that was me in communication with Reynolds," Rossmiller acknowledged in a telephone interview Friday night. "But I can't comment further." June 4, 2006 update: In a major Washington Post piece on Rossmiller by Blaine Harden, "On the Web, Looks Can Be Deceiving: Judge Tracks Terrorism Suspects From Home," she reveals that she has turned over to federal investigators about 60 "packages" of information on suspects outside the United States. That makes the two Americans arrested seem like an afterthought. Mrs. Rossmiller poses as an al-Qa'eda figure to establish links with a senior Palestinian terrorist. He seeks ties to Osama bin Laden's organisation and proposes to damage the ailing peace process by assassinating Mahmoud Abbas, president of the Palestinian Authority. Arrested. When an al-Qa'eda cell leader in Gulf area seeks outside assistance for WMD attack, Mrs. Rossmiller pretends to be working for the terrorist leader Abu Musab al-Zarqawi. The man boasts of battles with British and US forces in Iraq, claiming to have killed 20. His details are checked and confirmed. Mrs. Rossmiller arranges a meeting. Terrorist and nine associates arrested. Three Egyptians in the US seek assistance to carry out attacks. Instead they meet a stand-in for Mrs. Rossmiller. Arrested. Oct. 4, 2006 update: Reynolds was indicted by a federal grand jury with providing material assistance to terrorists, soliciting explosives, knowingly distributing information about the construction and use of explosives, and possessing hand grenades. The indictment accuses Reynolds, who currently makes his residence in the Lackawanna County jail, of having "offered to assist al-Qaeda in engaging in acts of terrorism within the United States by... identifying targets, planning terrorist attacks, describing bomb-making methods, among other services." He hoped to enlist "al-Qaeda members to carry out violent attacks against pipeline systems and energy facilities in an effort to reduce energy reserves, create environmental hazards, increase anxiety, and require" federal officials to spend money to protect them, the indictment said. July 11, 2007 update: Rossmiller tells her story in "My Cyber Counter-jihad," Middle East Quarterly, Summer 2007 issue. By coincidence, today also sees the unveiling of her website, www.shannen-rossmiller.com. July 14, 2007 update: Michael Curtis Reynolds was convicted yesterday of on two counts of providing material support to terrorists; soliciting a crime of violence; unlawful distribution of explosives; and unlawful possession of a hand grenade. Specifically, he tried to help al-Qaeda to blow up the Trans-Continental gas pipeline, a Wyoming refinery, and the Trans-Alaska oil pipeline. The federal jury of six women and six men pondering his fate took little more than an hour to find him guilty of attempting to provide "material support to al-Qaeda" and "resources to be used in maliciously damaging or destroying property by means of force or explosive." It also decided that that Reynolds "solicited others to engage in a felony using physical force against property" and "knowingly distributed through the Internet information to be used and in furtherance of criminal violence." Shannen Rossmiller responded to the verdict, saying, "I'm very happy justice prevailed. This will hopefully serve as a deterrent to anyone to cause this country harm in the name of al-Qaeda." Nov. 6, 2007 update: Michael C. Reynolds, 49, was sentenced today to 30 years in federal prison. Jan. 9, 2009 update: Rossmiller announced yesterday her plans to join with an unnamed defense contractor to teach internet counterterrorism to a "cyber corps" of intelligence experts. As the only known private U.S. citizen who has successfully initiated arrests and convictions of terrorists, she has helped with 214 espionage and terrorism cases. But Rossmiller found it too taxing testify in open court and plans not to become part of the chain of evidence again. The responsibility of making the prosecution's case in the Reynolds trial persuaded her to turn to teaching. "I was vomiting blood before I had to testify in court against Reynolds. I developed kidney stones and a bleeding ulcer. It takes you down. I thought it was going to be the end of me. … There are a lot of people who can be trained to do what I do. I don't want the notoriety or the pressure. I can teach people who will be paid professionals, not volunteers like me." For a Fox News Channel report on her and the announcement, see "Fighting Cyberterror."